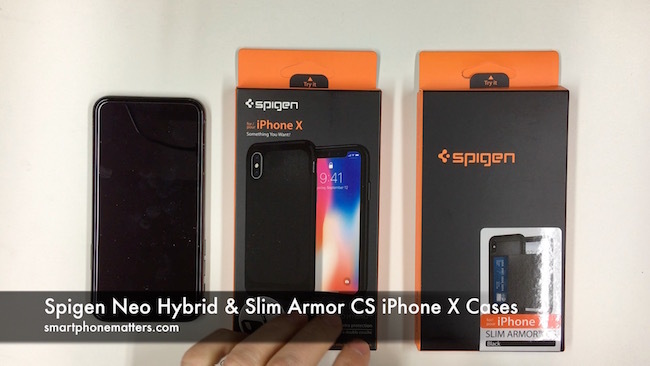 Today I am going to take a look at two cases for the Apple iPhone X, the Spigen Neo Hybrid and the Spigen Slim Armor CS. The Spigen Neo Nybrid cost $17 and the Slim Armor costs $20. You can pick up both the cases on Amazon.com. First up is the Neo Hybrid. This is a two part case. The main part of the case is made from a flexible TPU that is soft and flexible. The outer part of the case is a hard poly carbonate bumper. I was able to install the case as one piece. The bumper is a shiny plastic, while the TPU shell is matte. The back of the case has a herring bone pattern but still feels smooth. The case protects both the top and bottom as well as the left and right sides. There are cutouts for the lightning port and speaker grills on the bottom as well as the mute switch on the left and camera on the rear. There are plastic buttons for volume up and down and the sleep / wake switch. The camera cutout is slightly raised to protect the camera. The phone sits flush on a table as the case removes the camera hump. The front side of the case was a raised lip so the screen won’t touch the table if you put the phone face down. The inside of the case has a ribbed pattern which I assume adds cushioning. I bought the Jet Black color. The Neo Hybrid also comes in Gunmetal, Satin Sliver, Burgundy, and Pale Dogwood. Next up is the Slim Armor CS. The Slim Armor CS has card storage on the back of the case. The card storage has a sliding cover over the card compartment. The card storage slot is big enough for two cards and some cash. I tried it with my driver’s license, a credit card, and a twenty dollar bill folded in thirds and it all fit. Like the Neo Nybrid the case is made from TPU and polycarbonate. The inside of the TPU has the same ribbed pattern as the Neo Hybrid. The case has cutouts for the speaker grilles, lightning port, mute switch, and rear camera. The volume up / down and sleep / wake switch has plastic buttons covering them. I was able to install the case as one piece but removing it was significantly harder than the Neo Hybrid. The case came off in two pieces but everything was undamaged. This case is considerable thicker and bulkier than the Neo Hybrid. If you are using this case with the card storage, you could leave your wallet behind so you are only carrying your phone. The case sits flush on a table, the rear camera is significantly recessed and the front side has a bigger lip to protect the screen when placed face down on a table. Spigen says the case is drop tested for 4 feet, 26 times. The case is available in four colors, Black, Gunmetal, Blush Gold, and Satin Silver. I haven’t had the chance to test either of these cases with wireless charing yet, but according to thr reviews on Amazon they do work with wireless charging. One thing to keep in mind is that both of these cases have a lip on the bottom of the screen that make the swipe up gesture a harder to do. The swipe up gesture replaces the pressing the home button for many tasks so it is something you’ll be doing all the time. I’ll need to use these cases more to decide if this is an issue. Overall I like both of these cases so far. right now I prefer the Neo Hybrid, but I also am going to try leaving my wallet behind with the Slim Armor CS as well.